At CHOC Children’s, we understand that the hospital can be a scary, unpredictable place and that children better cope with hospital stays when they trust the hospital staff and feel safe. Our associates build positive relationships with patients and their families while keeping the overall atmosphere calm and child friendly. We do everything possible to make our hospital a home away from home during inpatient treatment. Prior to a child’s admission or beginning outpatient services, families have the opportunity to tour the Hyundai Cancer Institute at CHOC Children’s. Caregivers can ask questions and meet staff members. Our child life department conducts special tours that allow our patients to learn about the hospital and see the rooms and equipment used by our staff. Families are also encouraged to use our comprehensive hospital packing list when preparing for their hospital stay. 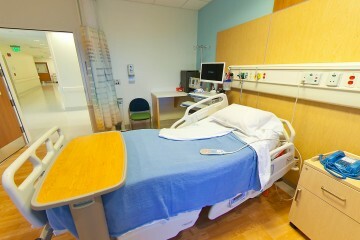 State-of-the-art hospital facilities provide many of the comforts of home. The Bill Holmes Tower provides a truly healing environment for our patients and families, plus a host of family amenities to make everyone feel at home. Our all-new, oncology unit in the Bill Holmes Tower is home to 28 private beds. All patient rooms have wireless Internet access, flat-screen televisions with family-friendly cable television and upgraded movie channels, an individual mini refrigerator, sleeping cots and a comfortable glider chair. All rooms also include a Playstation 360 and a safe for storing personal belongings. Learn more about what to pack for a hospital stay. CHOC offers a play room for Cancer Institute patients, family and friends that is staffed by volunteers. The play room is open Monday through Friday from 10 a.m. to noon, 2 p.m. to 4 p.m. and 6 p.m. to 8 p.m. Saturday and Sunday it is open from 10 a.m. until noon and 2 p.m. to 4 p.m. The play room is equipped with a variety of activities for all age groups ranging from arts and crafts to infant and toddler toys to video games and board games for older kids. 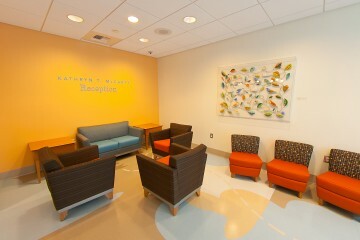 Patients’ siblings are encouraged to use the play room along with the patient. All of these activities can be brought to the patient’s bedside if they are not able to visit the play room. The teen room provides teens and young adults a place to go where they can spend time with other patients their same age and hang out. Patients can invite teen siblings and friends to hang out as well. They can play video games such as the PS3, X-Box 360 and Wii. Patients can also watch movies on the large-screen television, use the computer to get online, listen to their favorite music or grab a book to read. Exercise can be very beneficial for cancer patients, and we are pleased to offer Cancer Institute patients their own gym. 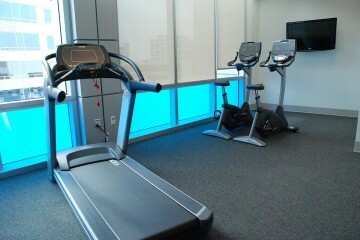 The gym contains a treadmill, stationary bike, towels, water and a flat screen television. It is open to patients who have approval from their physician to exercise 8 a.m. to 9 p.m. Physical therapists also use the gym with hematology/oncology patients who have had physical therapy ordered by their physician. Parents and legal guardians are allowed to use the gym from 5 a.m. to 7 a.m. and 9 p.m. to midnight. Visitors and siblings are not allowed to use the gym and those using the gym must wear appropriate gym attire. One of our goals at the Cancer Institute is to always make our patients and their families feel like they are at home. As part of this mission, we offer our families a special lounge featuring a television and an eating area with a sink, refrigerator and microwave. At CHOC Children’s, we strive to keep our patient rooms pleasant, happy places and understand that there are times in which parents and guardians may wish to discuss complicated medical plans privately. Our two Family Consult Rooms offer family members a place to discuss important information and decisions with our physicians or with one another. Each private room features a table, chairs and computer. The Cancer Institute’s Nourishment Nooks provide families with quick access to coffee and water throughout the unit. The “Hope Room,” created through a generous donation from the loving family of Sean’s Hope Foundation, offers families educational resources including Internet access, books and pamphlets. This information is cancer specific and disease specific, allowing families to learn as much as possible about their loved one’s condition. Open 24 hours a day, the Hope Room provides instantaneous access to information of vital importance to individuals coping with cancer. The computer also allows access to email, helping families keep in touch with friends and other family members on a continuous basis. Many families create websites or blogs so that friends and family can check in on the progress of a patient without disturbing the patient or caregivers. Our Rainbow Rooms are two specific rooms set aside for end-of-life hematology/oncology patients. These special spaces are designed to provide a comfortable, private place where a patient and their loved ones can share time together. Caregivers and immediate family may stay overnight with the patient and our staff works hard to make it as comfortable as possible. To further the patient’s comfort, families are encouraged to bring the patient’s favorite toys and objects from home. The patient is provided around-the-clock care to ensure their pain is controlled, their needs are met and family members are allowed time away. Although Cancer Institute associates always encourage family members to be with patients, there are times when a child needs to rest or when guests must be limited. Our comfortable reception area is located just outside the patient care area and includes comfortable seating, a television, wireless Internet access and coffee. Additional space is available just off the elevators with even more chairs, a loveseat and a television. A volunteer is also available in the lounge area to assist families. Some patients will undergo a surgical procedure while staying inpatient at CHOC Children’s. 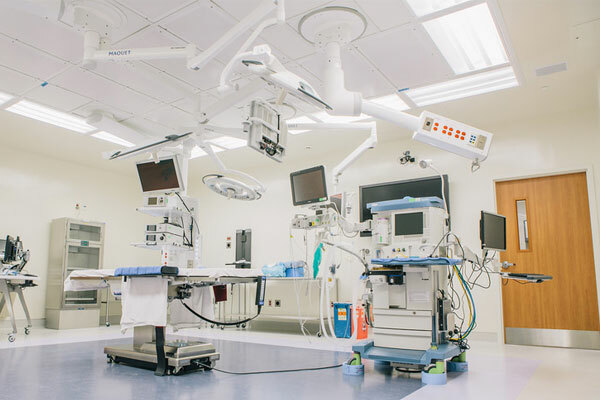 The Tidwell Procedure Center is one of the most state-of-the-art facilities in the region and provides a variety of comforts, including private pre-op rooms and much more. Learn more about the Tidwell Procedure Center. Child Life provides normal life experiences for kids in the hospital. There’s no place like CHOC for children and their families and one big reason for that is our outstanding child life team and its innovative programs. The ultimate goal of child life at the Cancer Institute is to make children as comfortable as possible before, during and after hospitalization. Since the physical limitations and emotional stress of cancer can disrupt a patient’s normal social growth and development, our child life specialists strive to provide children with as many normal life experiences as possible during treatment. They act as advocates for the patient and family, and provide bereavement support in case there is a loss. Child life specialists work closely with other members of the team such as doctors, nurses, psychologists and social workers in promoting patient- and family-centered care. Our child life specialists help decrease anxiety surrounding diagnosis, treatment and hospitalization by using play and explaining treatment and procedures in language appropriate to the patient’s age and development. They are experts in pain management techniques that do not use medications. They also teach other family members the coping skills they may need to care for a child with cancer and work closely with siblings to help them address their concerns. Additionally, our child life specialists help make taking medicine easier. They have tips for disguising the taste of medicine and can help children practice swallowing pills. Patients at the Cancer Institute truly benefit from child life services. They represent “safe” staff members and children know that our child life specialists are there for fun and comfort – not for “treatment” or “procedures.” They are a crucial part of the health care team. Child life offers a variety of services and programs designed to help patients and their families cope with their cancer. Pet Therapy Pet therapy is available two times per week for both inpatients and outpatients at the Cancer Institute. Specially trained dogs who have been meticulously bathed, groomed and certified through the Delta Society or Therapy Dogs International visit children while they receive their chemotherapy treatments or at the bedside. These dogs bring smiles to the faces of our patients, allowing them to take delight in the joys of a pet during a very difficult time in their lives. 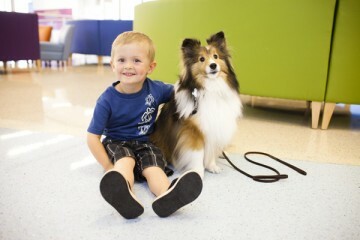 The pet therapy dogs can bring a sense of normalcy to patients with a long hospital stay, help them cope during a procedure or provide encouragement for patients who need to get out of bed. Music Therapy Available Monday through Friday, our music therapist works with patients of all ages and has taught children how to play several instruments, including drums and guitar. 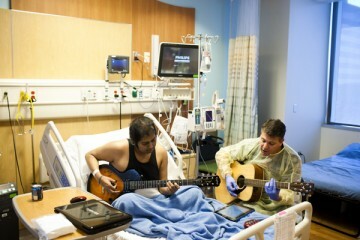 He also works with patients record their own music on CDs. Bedside Reader Two days per week, a CHOC volunteer reads to young children at their bedside. The stories provide children a temporary escape, while providing caregivers the opportunity to step away and refresh themselves. Bedside Artist Two days per week, a CHOC volunteer visits patients at the bedside in order to provide them with art activities. This is a great opportunity for patients to be creative. School is a normal activity for children and adolescents. CHOC School can offer a familiar routine, address the healthy part of the child’s life during their stay and show that they can expect to return to normal events. CHOC School also gives children a chance to be creative and productive while maintaining a sense of identity and hope. Use the hospital stay as a positive event. Develop an academic plan for all school-age patients, taking into account their medical situation. Assist parents in setting up home teaching for patients who cannot return to school upon discharge from the hospital. The CHOC School serves patients from kindergarten through 12th grade. Children with special needs can be enrolled in the school program at three years of age. The program operates five days a week, 9 months out of the year following a traditional school calendar. Parents are encouraged to bring books and schoolwork from their school or home teacher. Should schoolwork not be available, appropriate grade-level work will be provided. Our teachers maintain records of attendance and progress, which can be sent to the patient’s school upon request. Individual bedside tutoring is provided for those patients who cannot attend school in the classroom. The CHOC School is staffed by a dedicated credential teacher and highly qualified instruction aid from the Orange Unified School District. In addition to providing formal schooling, they provide educational support and developmental activities to the patients. As members of the patient’s care team, they consult with other professionals involved in the patient’s care. Please contact Doris Stein with the Orange Unified School District at (714) 509-8567 or dstein@choc.org with questions about a patient’s specific educational needs. Life with cancer can be overwhelming for children and their families. The associates at the Hyundai Cancer Institute at CHOC Children’s strive to create fun, unique events and experiences for patients of all ages. For information on these events or additional events that go on throughout the year, speak with your child's nurse or case coordinator. CHOC patients regularly receive special visits from our local community, including surprises from Disneyland’s world famous characters, athletes from the Angels baseball and Ducks hockey teams, and a variety of celebrities. Child life will inform families and patients of special visitors and entertainment beforehand. Several times each year, current teen patients are invited to a night out of the hospital. These events bring the teens together for an evening that allows them to have fun and make new friends who understand what they are going through. Once per year, the Cancer Institute teams up with the American Cancer Society to host an event in Orange County for all cancer survivors. All past and current patients are invited to a day of fun for themselves and their families. Each year the Irvine Lake and the Bass Clubs of Orange County team up with CHOC Children’s to host a fishing trip for current patients and their families. Patients are invited to a day of fun out at Irvine Lake where they go fishing in boats out on the lake and come back to a barbeque, games and much more. Every June our Oncology Ball is held for many of our teen patients and their dates. It is a complimentary event complete with photos, a DJ, dress attire and entertainment. Not sure what to bring to the hospital? Find out with our hospital packing list. Find out about cancer support services available to patients and their families. Meet the Cancer Institute team. Learn more about surgical procedures at the Tidwell Procedure Center. Throughout treatment and recovery, our case coordinators work hard to ensure that patients and their families have everything they need to concentrate on what is most important: the patient getting well. Before patients are discharged, coordinators make all of the necessary home care arrangements, including home health care nurse visits if necessary. We also make sure that patients’ follow-up appointments are already scheduled and that prescriptions have been provided. Caregivers receive education about taking care of central lines and other vascular access devices and explicit instructions on signs of possible illness. Caregivers are always welcome to call the Cancer Institute at any time with medical questions. We have a doctor on call 24 hours a day, 7 days a week.